View from the deck of the Sea-Saw...where you see the sea! 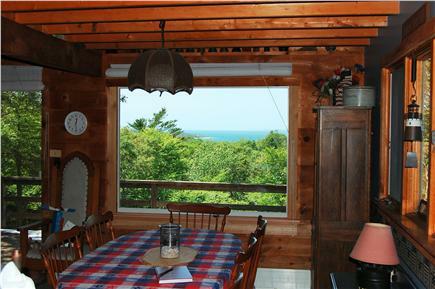 Open family room area with views of Vineyard Sound. Living room and ‘landing’ area...perfect for relaxation! View as seen from the kitchen and dining area. Kitchen area...the heartbeat of the home! Our master bedroom with queen and window AC unit. Our guest bedroom with queen and a window AC unit. 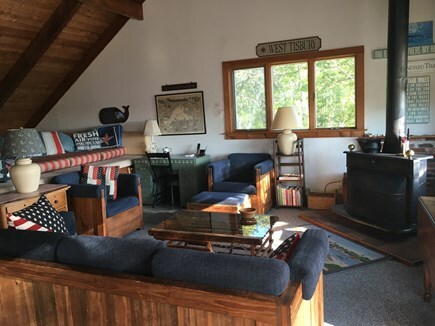 A cozy room with a patriotic flair! Two twins! 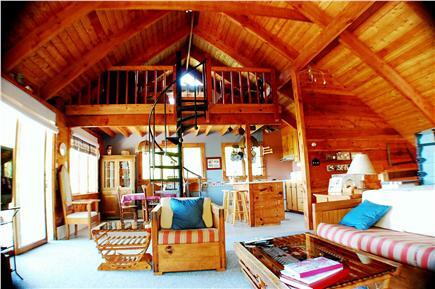 Loft with 2 twins is perfect for the young or young at heart! Sea Saw’s entry hallway welcomes you ‘home’! Shaded octagonal picnic table on our deck! Gather and enjoy! ''Sea-saw'' privately nestled in the woods above Lambert's Cove. Full bathroom with nautical theme. 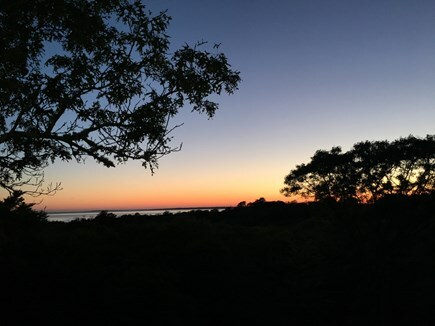 Our sunset view over Lambert’s Cove from living and deck area! Deck’s summer sunset with outdoor seating for up to 14 guests. Looking for a secluded spot to view the sea? The SeaSaw is the place for you. 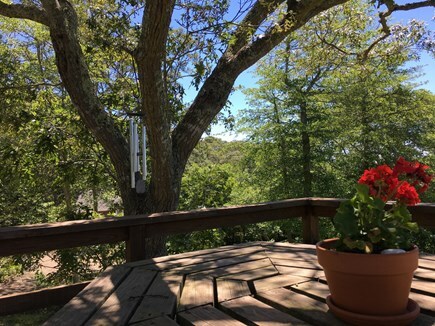 Spectacular views of the cove, Paul's Point, Naushon, and Vineyard Sound while inside or out on the deck. Secluded within a wooded area on the hills above Lambert's Cove Road, the SeaSaw is just three minutes from the entrance to Lambert's Cove Beach, a private and less crowded place to enjoy the calmer waters of the cove or to build dams in the Black Water Brook that spills out into the sea. Perfect for young and old. 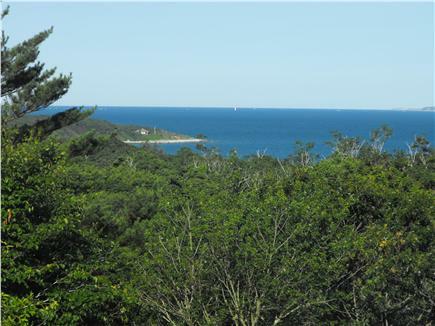 Lambert's Cove Beach is only available to homeowners and its guests of West Tisbury! This home is more than just a rental property. It is a place that welcomes its guests and calls them back each summer. A tree swing and hammock entertain the young, and the views mesmerize the old! Additional pricing info: Refundable security deposit of 200.00 and a non-refundable cleaning fee of 175.00 per rental. State and local taxes of 5.7% will apply.